* Finished Size: --- Please Select --- 5.5 in. x 8.5 in. (-0.5%) 8.5 in. x 11 in. 8.5 in. x 14 in. 11 in. x 17 in. 12 in. x 18 in. 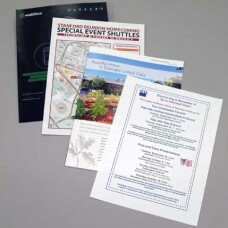 Affordable, quality color digital printing is one of our specialties. This catagory is for digital color prints that are collated or sorted loose, either one or two-sided. Stapled sets are an option as is 3-hole punching. We offer a wide range of quality papers, including 100% recycled options. If you need the piece folded, please use the Full Color Brochures & Letters product page assessible via the Categories sidebar at the right. We also do longer run offset color projects in partnership with the area's top tradeshops. Click the Contact Us link below panel and send us your specifications and we'll get you a quote. Many surveys have shown that color printing communicates more effectively than black & white. If your budget allows -- and hopefully our affordable pricing will help -- consider doing it in color!